The sun and warm air allow ClimateActivePaint ThermoProtect to quickly establish effective protection against the penetration of rain water. The excess moisture in the outer walls quickly evaporates thanks to ClimateActivePaint's coating function. The high resistance against environmental factors such as smog, acids, salt and ozone as well as UV-rays, safeguards the elasticity and prevents cracks caused by embrittlement or deterioration over a long period of time. Stress cracks are noticeably reduced as the thermal protection helps to prevent the building materials from expanding and contracting. 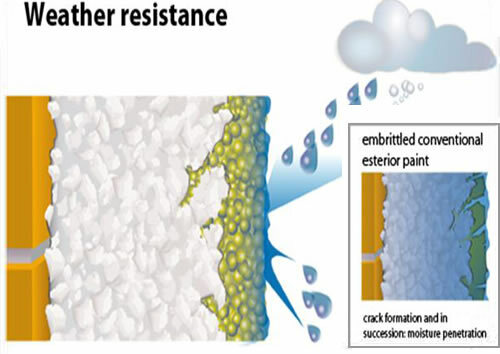 ClimateActivePaint is weather resistant in heavy rain, hail and snow. In this way, the coating keeps the building meterials dry thereby reducing the risk of the outer walls turning green, which is often the result of recurring condensation. Due to its high ceramic content and the prevention of moisture build-up on the surface, there is no breeding ground for moud, mildew or moss when using ClimateActivePaint ThermoProtect. Therefore, there is no need for environmentally unfriendly or harmful toxic products. Rot in or on the brickwork is avoided, as the coating reduces the moisture in the walls to equalised levels. ClimateActivePaint ThermoProtect is made in such a way that it will function properly for many years despite all environmental and weather conditions it has to contend against. The climate with its seasonal fluctuations offers the basic conditions necessary for ClimateActivePaint's coating to execute its energy saving and protective actions again and again. Just like our skin, the ClimateActivePaint coating covers a larger surface and allows the layers underneath to breathe sufficient air. "Artificial respiration" of buildings caused by air-conditioning can be reduced or completely stopped. This not only saves money; it also reduces the risk of the inhabitant catching a summer cold. ClimateActivePaint coating increases the efficiency of the brickwork insulation without sealing it off. This is an important advantage over other measures for reducing heat, which often seal off the brickwork, thereby suffocating it (or even drowning it in the worst case scenario). The brickwork is dryer and thus acts as an excellent storage area for heat, because only a dry coat can keep you warm. Therefore, the building needs to be heated less, as the "brickwork storage area" has enough heat stored, which is only depleted slowly. ClimateActivePaint prevents electrostatic charges on coated surfaces and stops dirt particles from sticking to the surface. Should there be some dirt on the surface after a few years, with the combination of ceramic and highly resistant base you can easily clean all coated surfaces with water or you can even use a high-pressure washer. 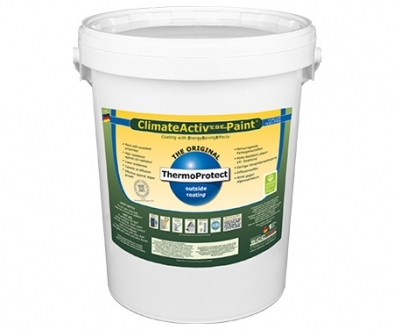 Thus, ClimateActivePaint ThermoProtect assures a longer than avarage color retention and consistent color brilliance.